Here at www.AMWmotorsport.co.uk we carry out many repairs and performance modifications for the Mitsubishi Evolution and are based in Bradford, near Leeds and Halifax in the West Yorkshire area. A common cause of problems with the Evo range from Mitsubishi is the Active Yaw control (AYC) pump. The AYC pump commonly corrodes internally, breaking seals and increasing distances between components, which need to be within a fine tolerance for the pump to produce pressure. Our AYC pump rebuilds use new bearings, new pump sandwich plate, seals etc. We also have specialist “plug in” wiring harnesses for manually bleeding the AYC pump. All our AYC pump rebuilds are on an exchange basis, and we can also remove and refit the AYC pump from/to your vehicle including bleeding the centre and rear diffs, depending on model, be it an Evo 4, 5, 6, 7, 8, 9 or 10 (iv, v, vi, vii, viii, ix or x). Please enquire for a price. We also carry a variety of AYC pump spares, from pressure sensors, solenoid valves, to housings and wiring looms. Another common fault associated with the Evo 4, 5 and 6 is the standard front differential. The bolts holding the front diff housing together sheer, which in turn can cause great damage to the differential/transferbox housing. 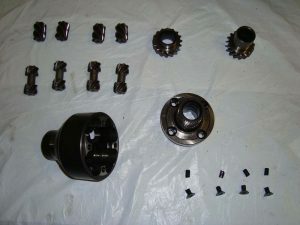 We carry out several remedies for this, from simple high tensile bolt replacement, or re-engineering the diff, to an aftermarket diff replacement. 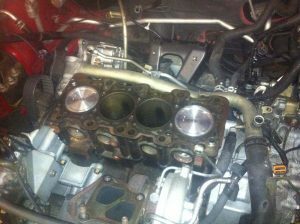 We also offer engine rebuilding for the 4g63/4g64, be it in standard or uprated form, as well as standard servicing, including gearbox, transfer box, rear differential and AYC filling and bleeding, cambelt and balancebelt replacement, clutch replacements and performance upgrades for the Evo range including performance manifolds and exhaust systems made in-house to your/our required specification.